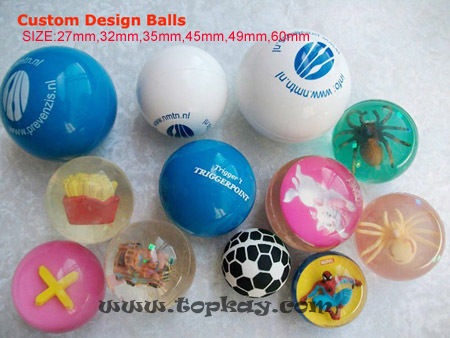 There are many different kinds of Custom Design Bouncy balls we can make. 1. Full Transparent Picture bouncing balls: A transparent ball with a double side printed paper picture card inside, double side printed (same/different picture both ok). 2. Half Transparent Picture bouncing balls: It is also ok to make the picture ball half transparent with picture inside and another half solid color/multicolor. 3. Printed Bouncing balls: cusotmer can print their logo, company name or web or even other image they like on the surface of the ball. One/two/there even more colors and more positions printing available. 4.3D Figurine balls: a plain or 3D figurine inside. Available sizes: 27mm, 32mm, 35mm, 45mm, 49mm, 54mm, 60mm. Best for patent items(like Disney/Waner/Marvel....)which are very popular in the market, and also best for promotion(with company name or logo), we have helped hundreds customers promoting their products successfully.